Social media is about creating a friendly connection with your market. It’s about listening to your consumer, responding to their wants and creating an emotional bond. This is nothing new in marketing (ok, I just spent my weekend DVR binging Mad Men and listening to Don Draper’s marketing wisdoms from the 60’s). A few differences these days is that understanding your consumer now really means immediate engagement and interaction. Have you ever read a blog post that just clicks with you? Like, a post that’s written in your language, and gives you the information or emotional boost that you were searching for just at that moment? Have you ever wanted to learn how to do that for your business blogging? I wanted to learn a little more about this too, so I did a lot of research into it. And now I’ve written this blog post for you. It’s all about creating a marketing personality on your blog that connects with your market. This isn’t about branding or your company’s image. It’s about having a blog written by real people that your customers can connect with personally, in ways that you can’t with a brand’s logo. In this article I’ll show you how four companies are doing this successfully and how you can do it to. When you think of insurance, you probably think of a lot of bureaucracy and a lot of long, legally worded forms. When insurance is sold, however, a good company makes you feel like you are their number one priority, and that they will take care of you in the case of an emergency. Can a national insurance company really be marketed to make you feel warm, fuzzy and secure? Geico does. Not only do they have a cute gecko with an attitude as their mascot, they take their online personalities further. Venture to their blog, and you’ll see an active, engaged community. Bloggers are Geico employees, who work in all aspects of their insurance company - from adjustors, policyholder service to marketers. The tone of their blog is more like a personal journal than a multi-million dollar insurance company. Every month, for example, they host a “Memory of the Month” photo caption contest on their blog. 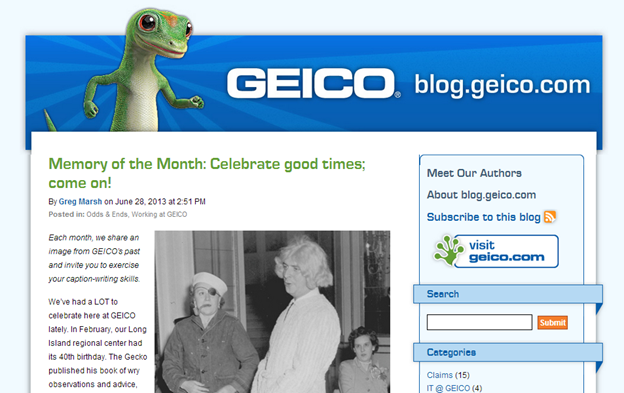 They upload an image from the history vaults of Geico, write a friendly blog article, and encourage their readers to engage with them. Readers are able to connect with the company by captioning the nostalgic photos. Geico makes it easy to post comments, share or like the articles. Blog topics also include safety tips and how to prepare for emergencies, Q & A’s with company executives, and interactive contests about being safe in numerous situations. 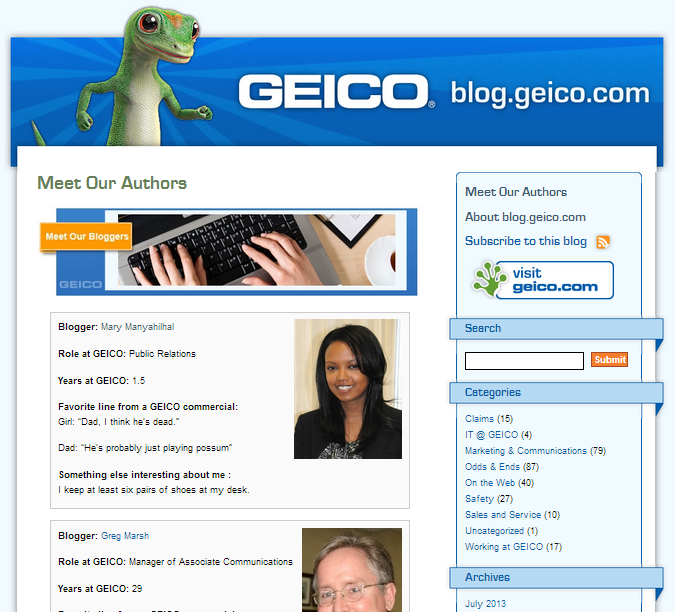 Another great way the Geico blog makes a personal connection is by including friendly, simple bios about each of their main blog authors. The bios include who they are at Geico, a favourite line from a Geico commercial, and something a little quirky about each blogger. Other insurance companies have blogs too. All State, for example has a very active blog. But the All State blog is more much corporate in design. Although there are lots of good safety tips, and, frankly, more blog posts than Geico, the Geico blog is written like they’re your friend. This is keeping with their national marketing efforts to be the good-humoured, gecko-lead, neighbourhood insurance company. And the Geico blog gets a lot more shares on Facebook. The Shauna Miller story is quite a remarkable one. 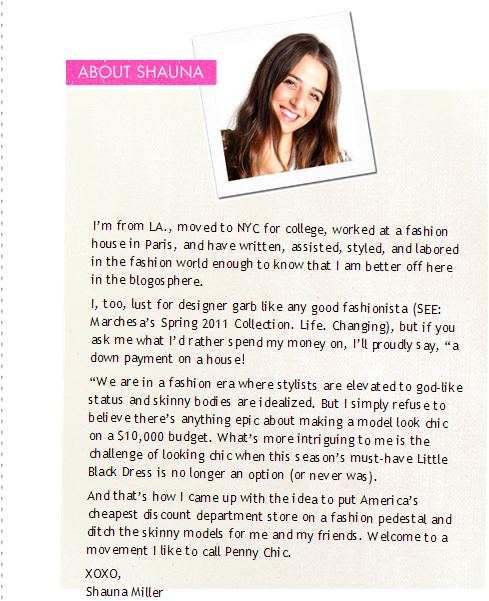 In 2010, Shauna was a 25 year old fashion designer and blogger. Her passion was making women feel good about wearing accessible high fashion. Shauna developed a blog called Penny Chic, showcasing her outfits from discount designer lines. She wrote her blog in a sociable, approachable and informative manner. She included lots of visuals, diary-like video cam videos, and sprinkled in a lot of her own charming personality. Within two years, Shauna now has her own Penny Chic designer line at Walmart. She maintains her Penny Chic blog, and still writes about inexpensive, authentic fashion, including her own Walmart fashions. For Walmart, this is a great marketing technique. The story is real, the author is very personable, and the blog connects with their target market. Many young women with a passion for fashion have their own styling blogs. The PennyChic blog is a bit of a cultural trend – and it shows Walmart leading that trend in its fashion. In the “About” section, Shauna also includes a very “reality show” like video. It’s mostly shot in her own bedroom (which super relates to the niche market of fellow fashion bloggers), but also includes footage of Shauna shopping glamorously, and has cool footage of her being interviewed on national TV talk shows. 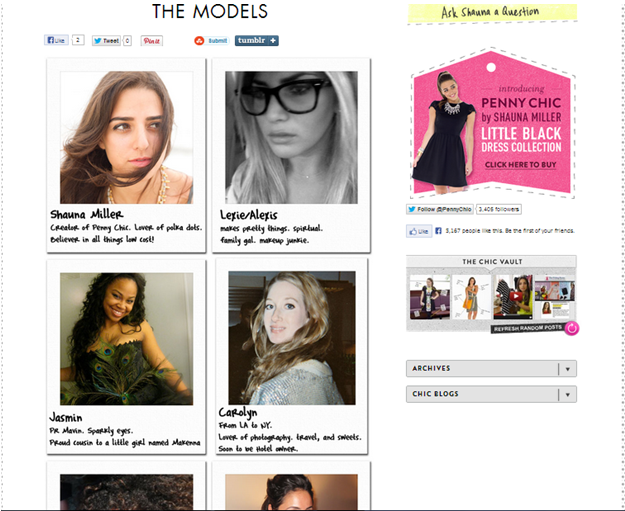 All of her models on the site are regular people – including Shauna. Unlike more corporate fashion blogs, each of the models are profiled, with Polaroid like images, and a hand written quirky short bio about who they are and a little known thing about what they love. Her mom is the photographer. Shauna excels in all of her amazing talents. She is a fashion guru with tech know-how, and has a wonderful ability to market her passions in a very personable, related, connected manner. The marketing team at Walmart will do well to keep her line, and to keep her blog in the authentic, socially adept style it has. B2B bloggers can create a very personal persona too. 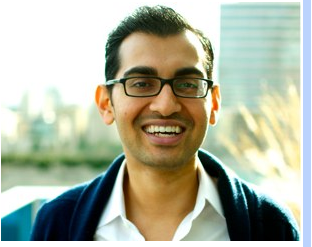 An amazingly globally recognized leader in the B2B (and any commerce) space is Neil Patel. Neil is an entrepreneur who co-founded QuickSprout, KISSmetrics, and Crazy Egg. He’s not only kind of a big deal, he’s also kind of a marketing genius. He’s been called a top influencer on the web by the Wall Street Journal, and named a top entrepreneur in the world by Entrepreneur Magazine. So, how does a world renowned marketing millionaire blog to business customers? Neil Patel has got to be the most well-known, personal, smart and consistently down-to-earth blogger in the world. Neil has worked with companies like General Motors, TechCrunch, buffer, Microsoft, and inuit. His blogging style, however, remains as if he is writing directly to you, and that he’s that guy at the party that everyone knows. 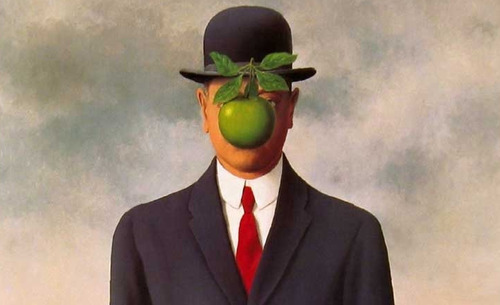 If you are in the social media marketing space, and don’t know who this guy is, I suggest you at least go check out his KISSmetrics blog (but do it after you’ve read this article, of course). He’s not shy about his blogging methods, either. He’s written many articles on how to write blogs that create a personal connection with your market. They’re all very accessible, super easy to read, and frankly, make a lot of marketing sense. As a B2B entrepreneur, he uses lots of infographics, networks a lot with fellow bloggers and business types, and always follows up with his contacts (whether that’s via email, blog comments, social platform interactions, in person or any other way to keep in contact these days). The thing that makes his blog so unique is that he gives real examples of how he has done the things he’s preaching in his own companies. Almost every post gives you a detailed break down of the revenue and website traffic he has garnered by using the tactics he writes about. More than anyone else I’ve seen, he practices what he preaches (and he’s damn good at it). Okay, go ahead and read Neil Patel’s Guide to Blogging, but do come back to finish reading my article too! There’s still more tips I’ve got for making a more personable blog for your business! In the vast array of grocery store chains, there is one that stands out for its personal connections to its customers. Whole Foods has created a brand that is tied to its consumers’ lifestyle and personal choices. So, it’s no wonder that they are a great example of blogging on a personal level with your patrons. Whole Foods does not have just one blog on its website, but three. Each blog site is personalized and written to connect both the reader, and the products that Whole Foods offers. Their main blog is called the Whole Story Blog. On it, you will find lots of seasonal foods with tips and recipes on how to use them. Being Whole Foods, the blog also has sprinklings of causes and tips to be healthy. The blog posts are written in a friendly, informative tone. They’re written in the first person, with lots of “I’s” and “You’s”, and some even read more like a excerpt from a Joanne Harris novel than a corporate communication piece. Here’s an example of the Whole Foods blog, and how they relate their food products to their consumers’ lifestyle. 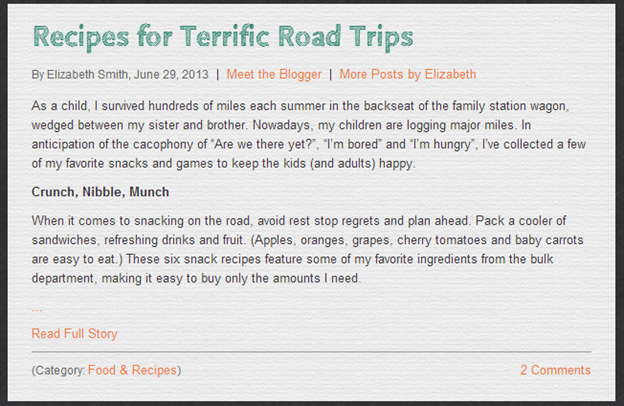 They wrote a blog about what to snack on during road trips. The post also has tips on family games to play in the car – all related to food and groceries. Most bloggers on the site has a brief bio about themselves, with a photo, so the readers are able to feel a stronger personal bond with the blogs and authors. Most bloggers have professional experience in health or nutrition. The two other blogs on the site are from Whole Foods’ co-CEO’s. Walter Robb’s blog has a lot of company updates, with lots of videos showing the actual announcements in the various locations they were made. The intros to the videos are written in a personal manner, without a lot of the traditional multinational corporation type dialogue. John MacKey’s blog also has lots of videos, with John being interviewed about lifestyle choices. Not every company would be so bold as to have their CEO’s express themselves personally on their public website. But, if you want to really connect with your customer, speaking to them in whatever medium they are on does bring a closer (and more loyal) connection. 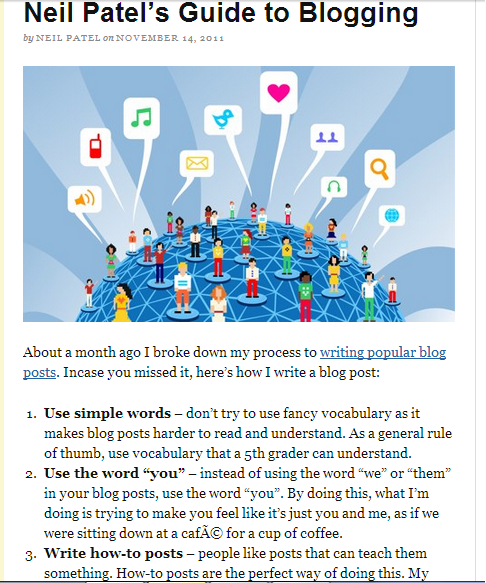 So how can you write more personally for your blog? Listen to your customer by responding to comments, and asking questions on your blog. What do you think? Have you used any of these methods? Do you have additional tips on how to blog to connect personally with your market?